Phase 1 Lineup announced today features 30+ artists including diverse headlining electronic acts: Tipper, Claude VonStroke, Lee Burridge, Claptone presents The Masquerade, Keys N Krates and OTT. Arts & Culture, Food & Beverage, Theme Camp & Environmental programming information included below. 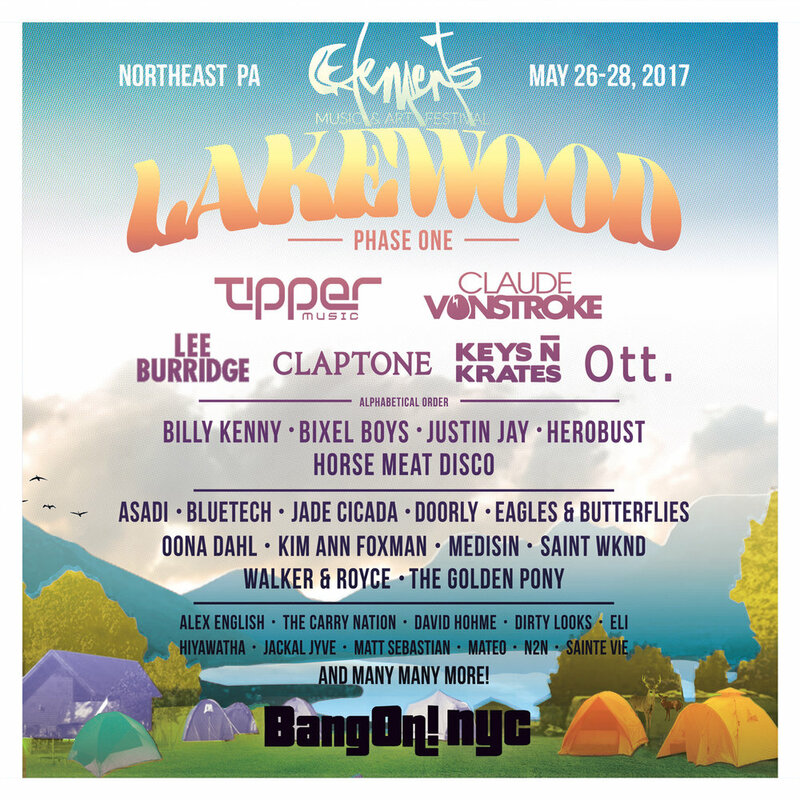 Music: Featuring Earth, Fire, Water, and Air themed outdoor stages with the finest electronic and live music. We will also feature 3 indoor late-night stages, a rock 'n roll themed bar with live music, the mystical Masquerade Party by Claptone, a roller disco, old-school hip-hop dance contests, an ambient/classical chill-out room, art cars cruising around to secret dance parties, sunrise/sunset DJ sets on the lake, and a boat stage setting sail every hour! Art & Activities: Large scale sculptures, interactive/immersive theatre, circus performances, art cars, LED installations, 3D video mapping, art galleries, and an expanded tribal market! Plus, a summertime smorgasbord of sports, camp activities, crafts, games, and much, much more! Food & Beverage: Local food trucks featuring tastes from around the world including plenty of vegetarian/vegan options, showcasing Pennsylvania and NYC favorites! Also featuring a proper beer garden showcasing craft brews from Pennsylvania and New York, special Elements themed drink bars, slushies, and more! Environmental: We strive to live and play in balance with Mother Nature. We will be incorporating alternative energy where possible, and recycling throughout the festival. We are also offering free parking and a $20 food/beverage voucher for those arriving by hybrid or electric vehicle. We will sponsor a grant for any approved art installation that incorporates solar power! Hit info@bangon-nyc.com to inquire!